If you’ve been following the blog, you will know I have been travelling these past few weeks. 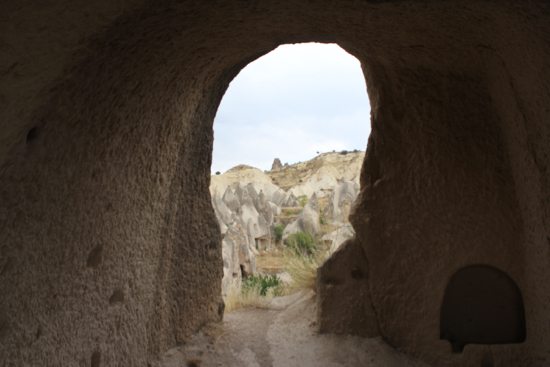 Last weekend I finally got around to visiting Cappadocia, and out of all the places I have been to in Turkey this awed me the most. The otherworldly landscape peppered with fairy chimneys, rock-cut Byzantine churches and multi-coloured rocks that look like they belong underwater have impressed many before me – not least John Henry Haynes, the pioneer of American archaeological photography. During an 1884 expedition Haynes wrote: ‘Altogether these rock formations and the multitude of excavated dwellings… appear to me now the most wonderful thing I have ever been permitted to rest my eyes upon in all my travels and among all the wonderfully interesting things it has been my good fortune to see in the land of wonders.’ (Robert Ousterhout pays tribute to the photographer in Cornucopia 44 and John Henry Haynes, available from the Cornucopia store, has a selection of his incredible photographs). 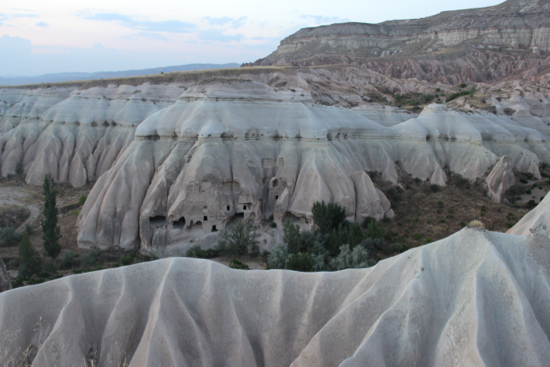 The volcanic lands of Cappadocia stretch across 400km of the high plateau of central Anatolia. Ancient eruptions covered the area with thick ash which solidified into a soft rock tens of metres thick. 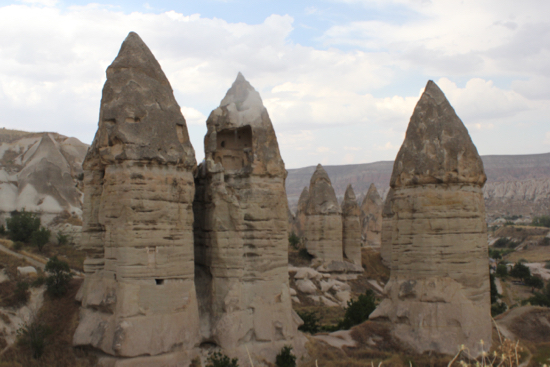 Add wind and water and you are left with hard elements which formed the cones, pillars, pinnacles, mushrooms and chimneys – some stretching 40 metres into the sky – that you see today. The area was the domain of the Hittites’ during the Bronze Age, briefly passed on to the Lydians, and then fell into the hands of the powerful Comnenus dynasty of Byzantium (famous for its horsemanship). In fact, the area’s ancient name was Katpatuka, meaning ‘Land of the Beautiful Horse’. (In a 30-page feature in Cornucopia 35, Susan Wirth describes a five-day ride from Avanos to Mustafasa, beautifully illustrated with photography by Jürgen Frank). 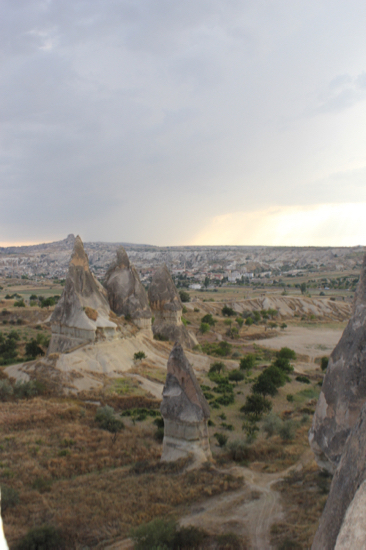 We didn’t explore Cappadocia’s magical valleys on horseback (and had little desire to try a hot-air balloon, despite the fact that it's on most people’s bucket list), and opted to go by foot instead. 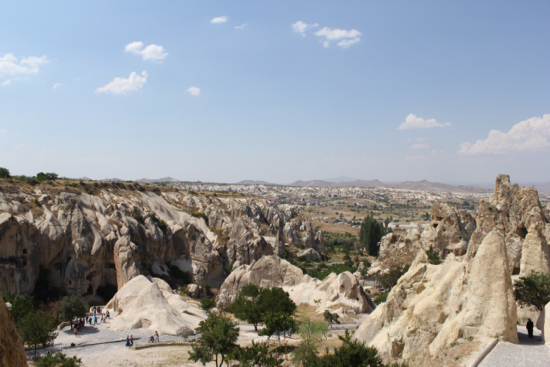 Arriving in Göreme on Saturday morning and filling up on a hearty breakfast at our hotel, our first stop was the World Heritage-listed Göreme Open-Air Museum (TL20), shown above. The site was originally an important Byzantine monastic settlement, housing around 20 monks, and became a famous place of pilgrimage from the 17th century onwards. There are six main churches and a nunnery, all decorated with frescoes, most depicting saints, others simple geometrical patterns, mythological animals and military symbols. 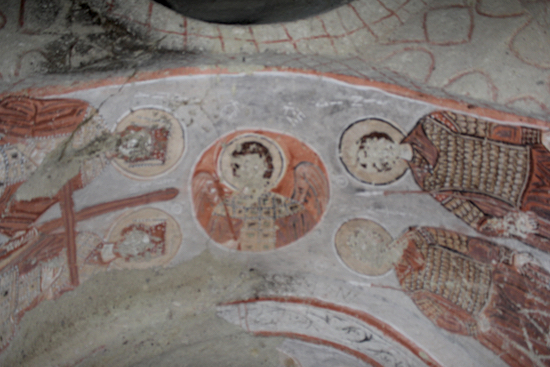 The difference in how they’ve been preserved is stark – some are almost indecipherable while others look as though they were painted yesterday. 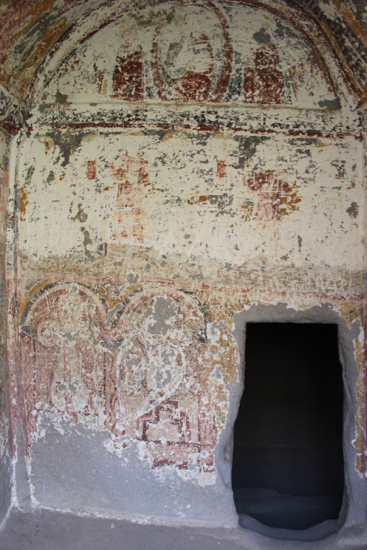 Spend the extra TL10 for the Karanlık Kilise (Dark Church) – the frescoes here are the finest. 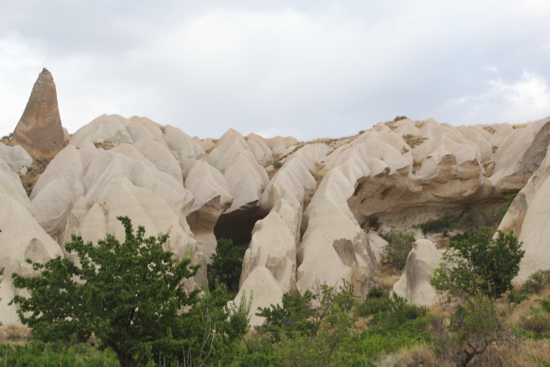 Once the heat of the day had passed it was time for our four-hour walk through Cappadocia’s valleys. If you’re a hiker, which I fancy myself to be, I would rate this walk as intermediate. It started off rather strenuously, with a 10-minute trek uphill and we thought we were doomed. 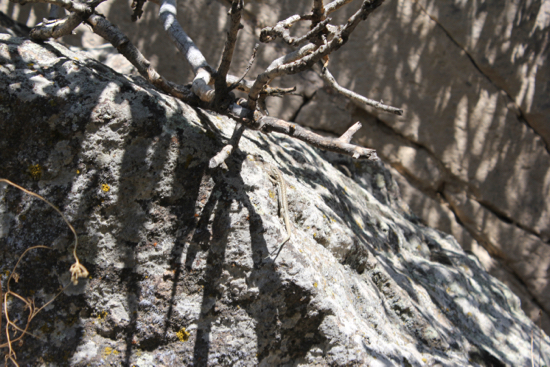 But for the majority of the walk the terrain was flat, with a number of narrow passageways and uphill rocks to climb. We stopped for four five-to-ten-minute breaks, the penultimate one to watch the sunset. I can't recommend this walk highly enough. 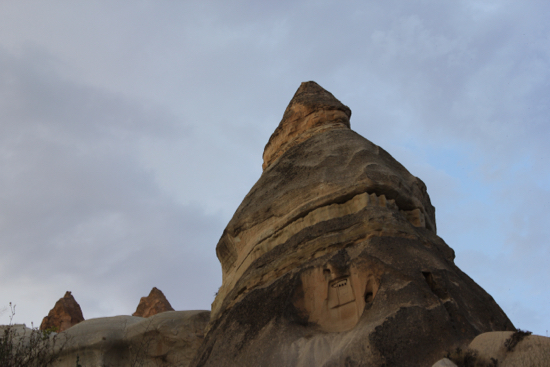 Whereas from a hot-air balloon you can see the unparalleled grandeur of Cappadocia’s landscape, the walk (like the horse ride, I imagine) let’s you get up close and personal with the rock formations. There’s an intimacy the hot-air balloon cannot provide and you can imagine, even if abstractly, the life of the people that once walked these parts. And one advantage of the walk over a horse ride is that you have the luxury of stopping more often to take photographs or simply to ponder the crazy beauty in front of you. 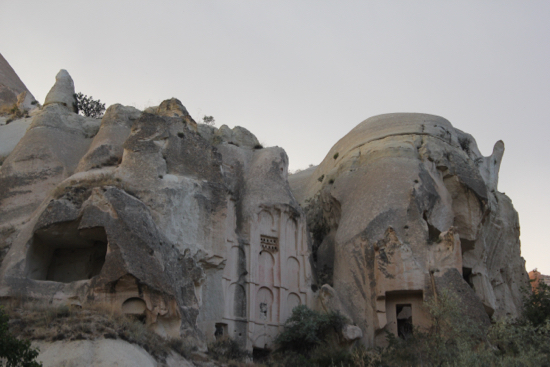 We could also climb into and explore the pigeon houses (Cappadocian dovecotes) and churches on a whim. 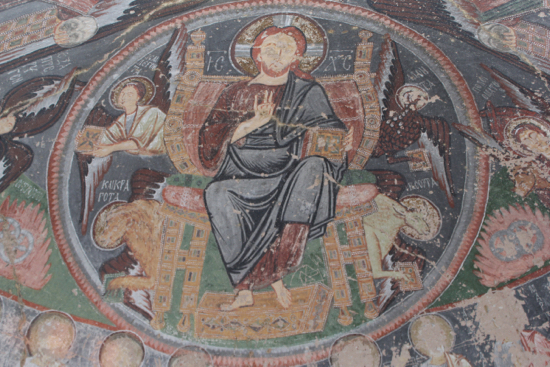 (David Barchard tells of the Byzantine sancturies and cathedrals in valleys undisturbed since the Dark Ages in Cornucopia 11). 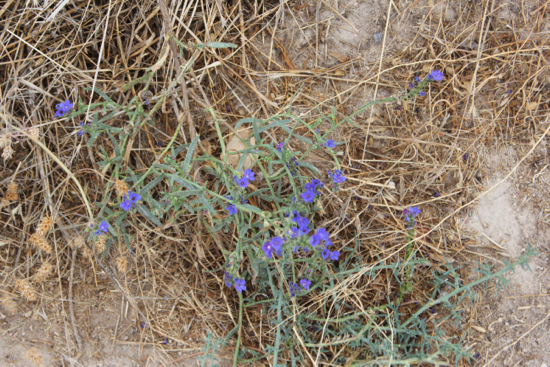 The walk started in Göreme and covered three valleys. 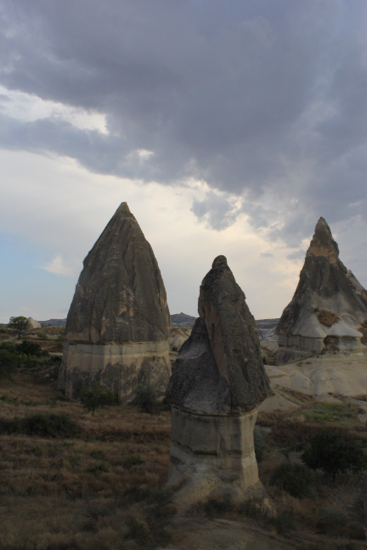 First up was the Kılıclar Vadisi (Swords Valley), one of the smallest in Cappadocia but worth a look for its unique grey-capped fairy chimneys alone (above). 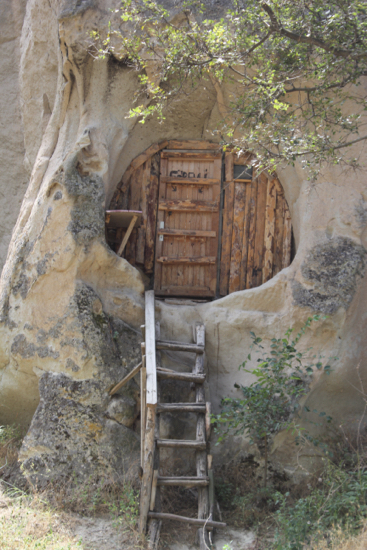 If you’re not going on a walk and just want to see the valley, the entrance is right above the Göreme Open-Air Museum. Turn right at the museum's exit and head up the S-bendy road for about 100 metres. You will see the entrance on your left. The valleys grew more exciting as we went on. 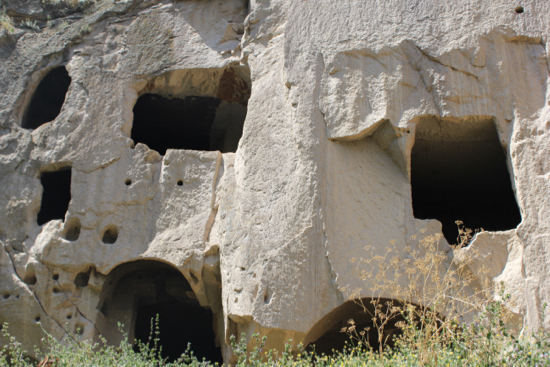 Next up was Güllüdere (Rose Valley), which has some of the most interestingly formed caves (with a temperature of 13 degrees Celcius, perfect for storing fruit and vegetables) and a number of pigeon houses. 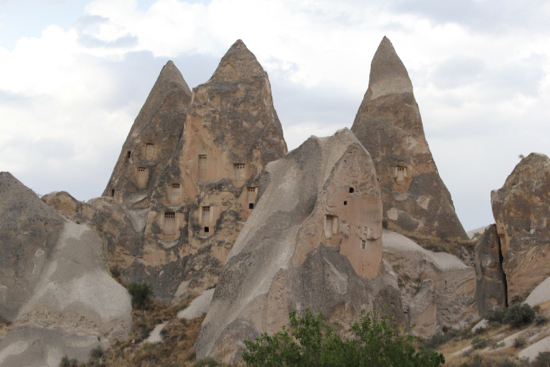 (For even more pigeon houses, take a walk in Güvercin Vadisi (Pigeon Valley), which leads from Göreme town to Uçhisar.) The views from Güllüdere are some of the best, so there was plenty of stopping for photographs. 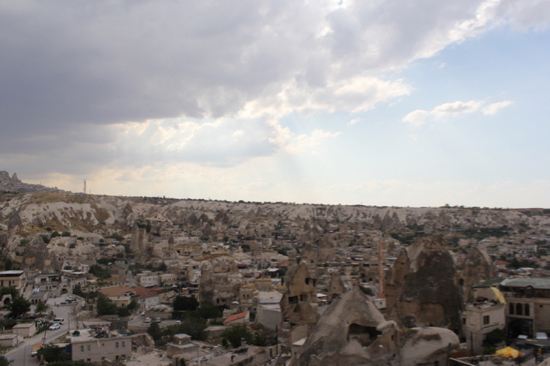 Finally, it was onto the mother of all Cappadocian valleys, the Red-Rose Valley. Rated as one of the world’s best walks, your path is sprinkled not only with some of the most spectacular rock formations in a kaleidoscope of colours, churches with well-preserved frescoes, and dramatic 360-degree views, but also an abundance of greenery, bold flowers, grapevines and apple trees. 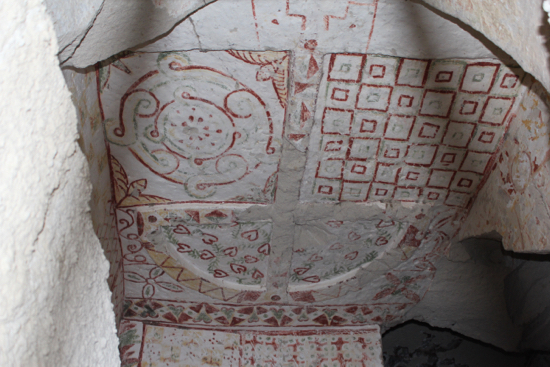 The above shows a fresco inside the Haçlı Kilise (Church with the Cross), atop a hill and reached by a narrow path. 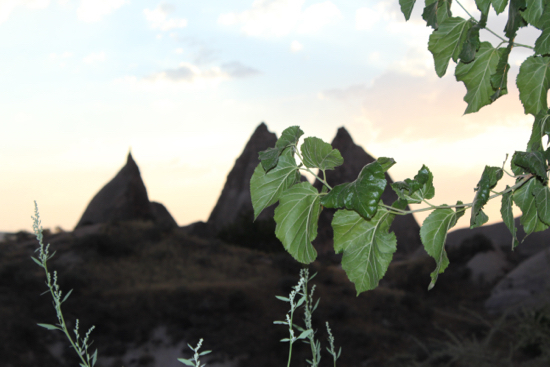 We stopped at the sunset point near Ortahisar, but compared to the landscape the sunset seemed somehow underwhelming. 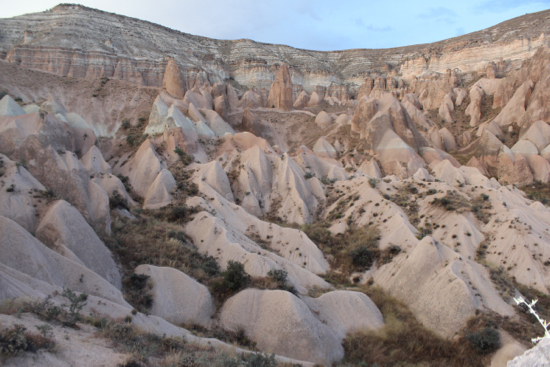 The next day we visited Ihlara Valley, a one-hour drive from Göreme. 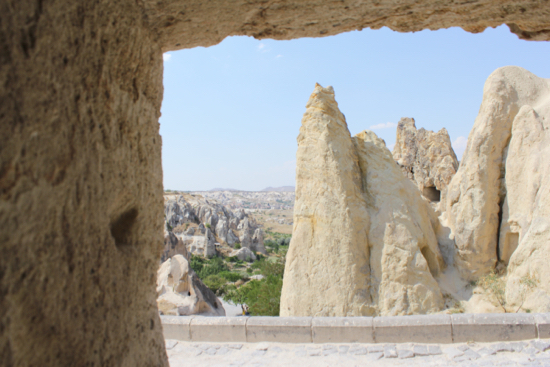 (I should mention here that having a car in Cappadocia is wise, giving you the freedom to visit the area’s districts and sights such as Uçhisar and Ürgüp, as well as its underground cities and – perhaps most importantly – wineries). 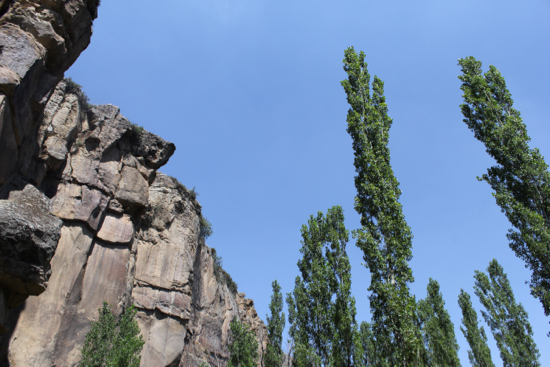 The Ihlara Vallery is more of a canyon than a valley, with smooth cut-rock walls enclosing a richly vegetated corridor through which once flowed the Melendiz River that formed the canyon thousands of years ago. 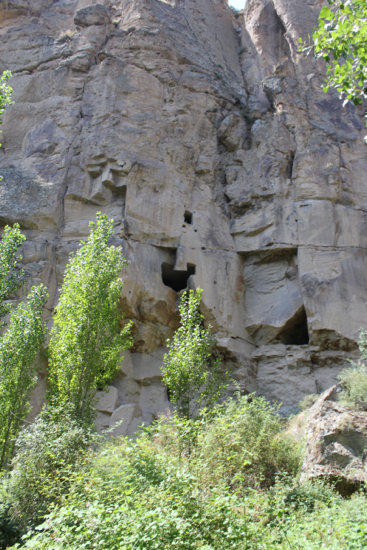 Once there were more than 4,000 dwellings here, housing a population of around 80,000, as well as over 100 cave churches decorated with frescoes, around a dozen of which remain today. 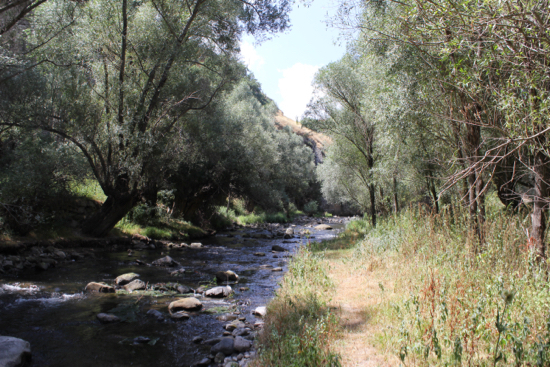 Beginning in Ihlara village and stretching to the Selime Monastery, the whole valley stretches for 14km. We walked four of those. Be warned: there are four entrances to the valley. We made the mistake of entering the first one, at the start of the Ihlara village. This means a rather treacherous climb down rocks and badly-marked paths to the river. Not for the fainthearted, but a challenge for adventurers. The second, main entrance has a civilised staircase down to a pleasant part of the river where you can dip your feet in the cool water or stop for a packed lunch. 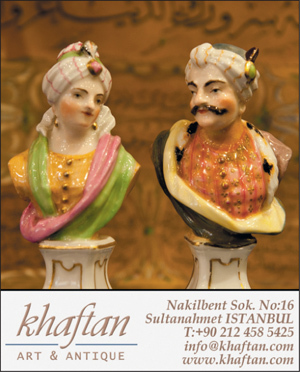 Besides its obvious attractions, Cappadocia is also known for its cuisine and great wine. In Cornucopia 31, Kevin Gould visits some of the regions’ wineries (some of the oldest in the world). ‘Until a generation ago, wine-making would have taken place in every home,’ he writes. ‘Clamber up to any disused cave or chimney-dwelling and the grape-pressing area is seen as a rock-carved, shallow rectangular trough, with a spout leading to a depression in which an amphora would rest and be filled.’ He also gives tasting notes and details of Cappadocian wineries, and if I’d had more than a weekend I would have been dedicating a day to wine tasting for sure. One final note: don’t miss the Topdeck Cave Restaurant on your visit. Yes, yes, it’s the highest-rated restaurant on Tripadvisor and you will hear a lot of English being spoken, but it has a simple menu of sensational home-cooked food. You can order a meze plate, and either a lamb, chicken, beef or vegetarian dish. Skip the vegetarian dish (the mezes will you give you your fill of veggies) and go for the lamb and/or chicken – the former melts in your mouth and the latter is some of the most flavourful chicken I have eaten in Turkey. And that’s a big call for this food-rich country. All photos by Daniel Salinas Conejeros.